If you haven’t attended one, you are missing out. The Open House, held each May, is a great way to showcase the Police Department. With tours, displays, food, and demonstrations, there is something for everyone. At last year’s Open House, the Cypress Police Department had ‘Team Soil BMX’ perform. The team highlights bike safety and discusses hot topics like bullying and living a drug-free life while wowing the crowd with amazing BMX tricks and flips. The team did their standard 45-minute performance of high-flying BMX action. Best of all was the “jump over the Chief” presentation. There were over 2000 attendees at Open House 2016, many of whom are our youth. The giveaway grand prize was a BMX bike. In addition, 24 certified bike helmets were given away. The Cypress Police Foundation is proud to have funded events at the Open House with a grant of over $3000. We hope to see you at Open House 2017 on May 6th. Check the CPF and City website for more information. The Cypress Police Foundation was established in 2010 as a 501(c)(3) not for profit corporation benefiting the men & women of the Cypress Police Department and the community in which they serve. Please donate now and help support the Cypress Police Department. Please visit our Giving page for more information on our organization as well as how you can help. Wayne Schoemann began a lifelong commitment to community service when he enlisted in the United States Army during the Korean conflict. For the past twenty years, he has selflessly helped others by delivering meals to seniors, veterans, and their families. He is especially called to help veterans, and volunteers at the Long Beach Veterans Administration Hospital. A 27-year Cypress resident, he has coached Cypress Little League teams and handled security for the Cypress Community Festival. For the past eight years, he has served on the Cypress Traffic Commission. The Cypress Police Department’s Volunteers in Policing (VIP) program has greatly benefited from Wayne’s fifteen-year commitment, enabling officers and professional staff to focus on their essential duties. He has transported police vehicles for cleaning and refueling, completed vacation house checks, enforced handicapped parking restrictions, and assisted with our P.A.C.E. program and community events. As a VIP leader, Wayne has trained new volunteers and assisted program coordinators with acclimating to their new role. 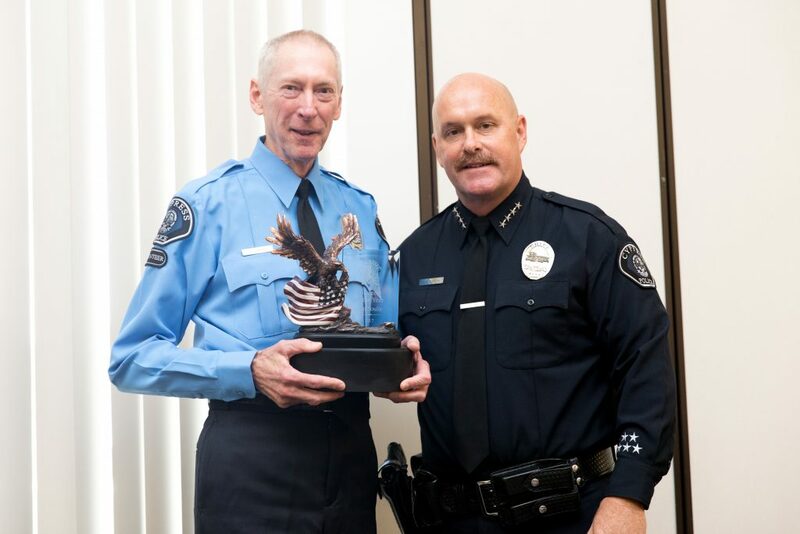 Recently, when several VIPs were unable to work their scheduled shifts, Wayne stepped up without hesitation to volunteer to cover extra shifts and also encouraged others to do the same. Wayne has earned a singular distinction by earning a 4000-hour volunteer badge, the first of its kind. Cresting that high point has not slowed Wayne down. He has already accumulated another 800 hours. The Chief of Police may be honored to present him with the first-ever 5000-hour badge later in 2018. VIP Schoemann’s professionalism and commitment to getting the job done is commendable and it is our pleasure to recognize Wayne with a Service with Distinction Award. On October 1, 2017, Officer Thomas Mellana was attending the Route 91 Harvest Music Festival with his wife and several friends in Las Vegas when a gunman opened fire on the crowd of over 22,000. Ultimately, 58 people were killed and 851 injured, making this the deadliest mass shooting in United States history. When the first volley of shots rang out, most concert-goers, including Officer Mellana, thought it was fireworks. As the second barrage of shots followed, a woman standing next to Officer Mellana was shot in the chest and arm, and a man standing next to him was shot in the chest. Recognizing the gravity of the situation, he began to render aid. He fashioned a tourniquet from the woman’s sweater to apply pressure to her arm, while simultaneously directing pressure to her chest wound. He coordinated others nearby to tend to the woman’s wounds and take her to safety, and then turned his attention to the man who was shot in the chest. With Mrs. Mellana using her cell phone as a flashlight, Officer Mellana located the man’s chest wound and applied direct pressure. Soliciting help from those around him, Officer Mellana pulled the man out of the field of fire to safety. Officer Mellana moved his wife to a position of safety and then returned to the field and began pulling other victims behind nearby bleachers to awaiting emergency medical personnel. When he came across a man with a severely injured leg, Officer Mellana quickly removed the victim’s belt and used it for a tourniquet prior to moving him to safety. Officer Mellana spent over half an hour running back into danger to provide medical aid and pull victims to cover. He exhibited selfless, valiant behavior which ultimately saved lives. For displaying bravery, above and beyond the normal demands of duty and under which the circumstances posed grave danger, Officer Mellana is hereby awarded the Gold Distinguished Service Award. On January 4, 2018, at 5:27 p.m., Cypress officers were dispatched to a residential structure fire with a female victim trapped inside the home. Upon arrival, officers found the residence was fully engulfed with flames and black smoke billowing from doors and windows. Orange County Fire Authority had not yet arrived on scene. Two officers punched the lock of a security screen and entered the residence in an effort to locate the female victim. However, they quickly found the fire and smoke too intense to continue their search. Meanwhile, Officer Godoy heard someone yelling for help from the rear of the home. Without hesitation, Officer Godoy immediately traversed a six-foot high wall, entered the rear yard, and located the unresponsive victim on the ground. Using his military training and experience as a Navy Corpsman, Officer Godoy assessed the victim and observed she had first and second degree burns, was suffering from smoke inhalation, and was fading in and out of consciousness. Several officers attempted to reach Officer Godoy through a walkway filled with smoke and flames when a large window above Officer Godoy exploded causing hot glass and debris to fall on him and the victim. 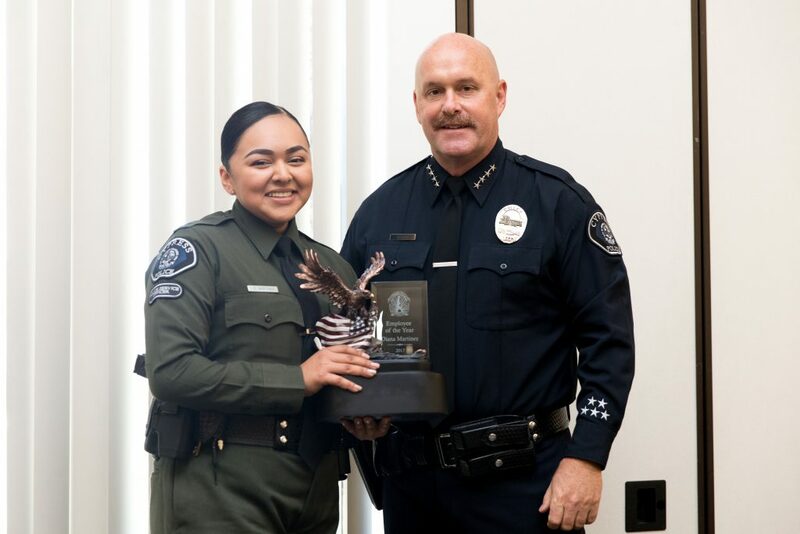 Realizing the circumstances were rapidly evolving into a life-threatening situation, Officer Godoy evacuated the victim by carrying her a distance of nearly 100 yards. 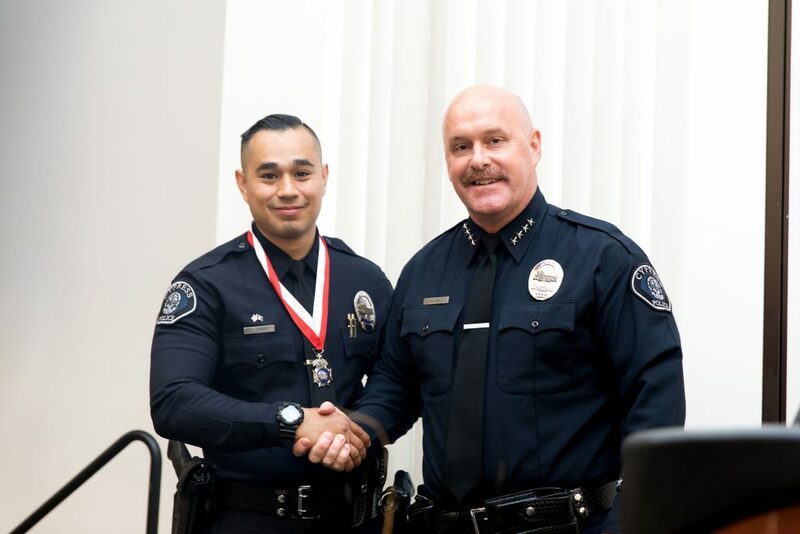 Officer Godoy showed courage and the ability to remain calm when there was no time for error, attributes which rise above the expectations for an officer in our Field Training Officer Program. His quick response in providing critical, life-saving aid was one of the primary reasons for the victim’s recovery. Officer Godoy is hereby awarded the Silver Distinguished Service Medal for exceptional actions in rendering aid during this situation. and in 2017 she became the coordinator for both West-Comm and Seal Beach Peer Support Team. On October 8, 2017, the Cypress Police Department suffered an unimaginable, devastating loss when Officer Matt Ward succumbed to his injuries following an off-duty traffic collision. Realizing our organization would need assistance, Marie Pope immediately came to our aid. She assumed the difficult task of notifying police personnel of Matt’s passing, coordinated meals for all shifts, and ensured Peer Support personnel were on hand to assist. Whether someone needed an encouraging word or a reassuring hug, Marie was a steadfast rock of support from the moment we learned of Matt’s passing through the day he was laid to rest. With our deepest gratitude, the men and women of the Cypress Police Department are pleased to recognize Marie Pope as our 2017 Citizen of the Year. After a stint in Missouri state government as the Director of the Missouri Council on Criminal Justice, Jay Sondhi moved his family to Cypress over 30 years ago to pursue a law career in the private sector. As the father of two children, Jay made a commitment to work-life balance, taking leadership roles as a youth soccer coach and later as board member and President of the Boys and Girls Club, board member of the Chamber of Commerce, as well as board member, President, and Treasurer of the Kiwanis Club of Cypress. process as a 501(c)3 non-profit corporation and since its inception his leadership as the Treasurer has helped raise substantial funds for the Cypress Police Foundation. The signature event of the Foundation is the sponsorship of the annual Cypress Police Awards Luncheon, attracting 200 attendees in its first year and to the current year waiting list to attend. It is with great pleasure we celebrate Jay Sondhi as 2017 Citizen of the Year. The Cypress Volunteers in Policing (V.I.P.) are a team of trained citizen volunteers who assist the Police Department with non-enforcement duties, which enables officers to focus on crime reduction. Volunteers are an important part of this organization and are proven to be a valuable asset to law enforcement agencies. Since October 2016, VIP Jim Soulis has dedicated nearly 1,000 hours of service to the Police Department. Jim leads by example as evident through his consistent dedication to service, coupled with his passion and unwavering work ethic. All who use our firing range, including our allied agencies, notice Jim’s pride and commitment to maintaining an excellent range within its design limitations. Last year, Jim was recognized as the 2017 Employee of the Quarter for his hard work, dedication, and genuine interest in the future of the organization. As the Department’s Assistant Range Master, Jim’s attention to detail inspires others and has resulted in a higher standard of organization and efficiency in our firing range. Jim enthusiastically assists with equipment needs for off-site training sessions, ensures the security of firearms and ammunition, and shares his breadth of firearms knowledge with others. Known as “Range Jim,” he plays an impactful role in our organization through his positive attitude, friendly smile, and desire to improve our firing range facility. He selflessly serves the Cypress Police Department as he has done during his years in the United States Navy — with pride and honor. Jim has earned the respect and admiration of many throughout the organization, and is certainly deserving of recognition as the 2017 Volunteer of the Year. to Police Services Officer in June 2017. 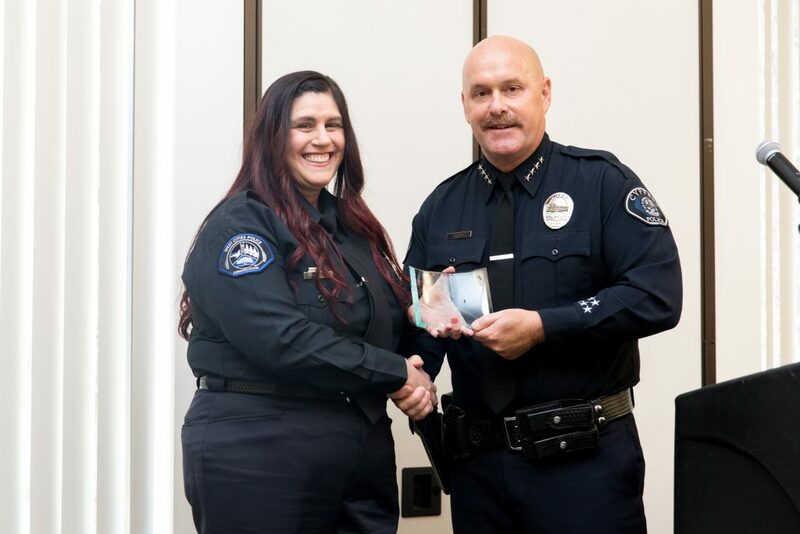 Diana’s work ethic, pleasant demeanor, unshakeable positivity, and willingness to take on additional responsibilities has made her an asset to the organization, and earned her the respect of coworkers, supervisors, and the Chief of Police. Recently she was credited for her ability to quickly master a challenging new software program and then mentoring others in successfully navigating the technology. PSO Martinez’s dedication to the Department is further demonstrated by her willingness to assist with events such as Shop with a Cop, Special Olympics Annual Torch Run, Open House, Cypress Police Appreciation Luncheon, badge pinning, retirement events, and more. She also served on our Social Media Committee. Diana is an asset to all divisions, and can be counted on wherever needed. Police Services Officer Martinez’s professionalism and commitment to duty is certainly deserving of recognition as the 2017 Employee of the Year. Matthew Charland was hired as a Cypress Police Officer in July 2011. He previously served for eight years as a United States Marine Corps Reservist, completing various assignments that included a five-month deployment to Iraq. He was also a 3-year veteran of the Costa Mesa Police Department, and a graduate of the Orange County Sheriff’s Department Academy. During his tenure, Matt has worked as a detective and served as a DEA Task Force Officer. His current assignments include: Patrol Officer, West County S.W.A.T. Operator, Homeless Liaison Officer, Field Training Officer, and Officer-in-Charge, which is a key support position to the shift sergeant. 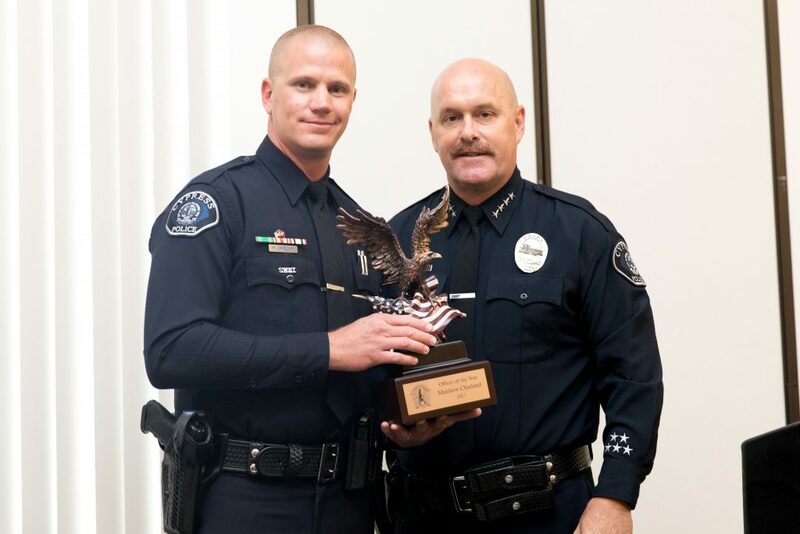 Matt’s dedication to the organization is demonstrated through his participation with events such as Shop with a Cop, Tip-A-Cop, Drug Take Back Day, Special Olympics Torch Run, National Night Out, Open House, and the Cypress Community Festival. Matt, who holds a Bachelor of Science degree from California State University, Long Beach, has earned his Basic, Intermediate, and Advanced P.O.S.T. certificates. 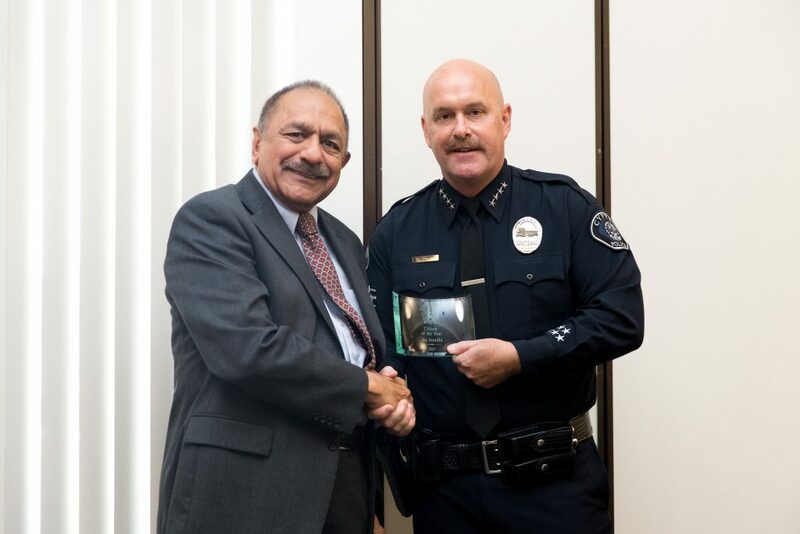 He was recently recognized as the Police Department’s Employee of the Quarter for his willingness to assist others, work ethic, and dedication. After serving three years on a narcotics task force, Matt brought with him a wealth of experience as he transitioned to patrol. He displayed admirable peer leadership by encouraging his shift to assume a zero-tolerance approach to narcotic violations in problem areas. Matt is admired by his peers and supervisors for his eagerness to lend a hand, the quality of his work, and the positive manner in which he performs his duties. 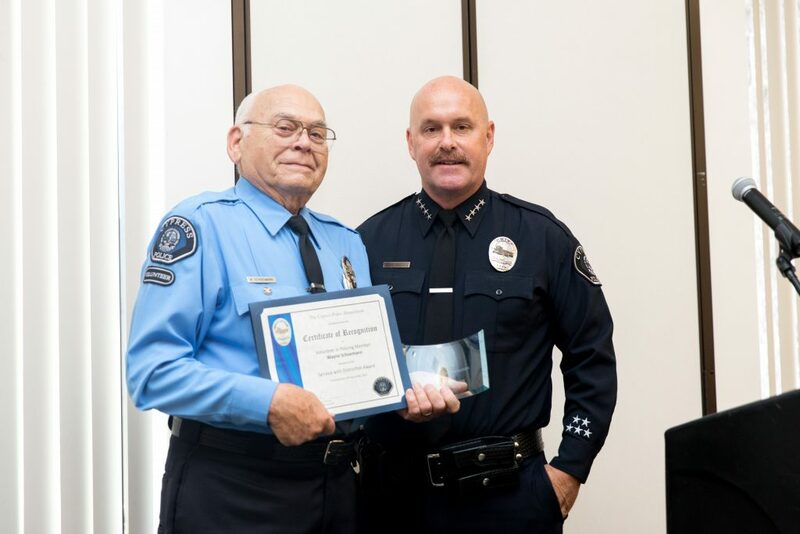 He has received letters of commendation and appreciation from citizens, supervisors, other agencies, and the Chief of Police for his commitment to the community, professionalism, and dedication to service. 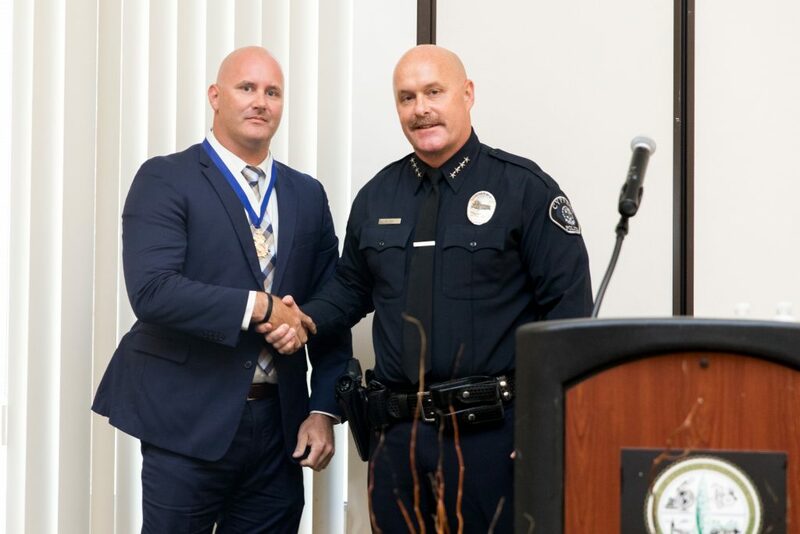 Officer Matthew Charland is a valued member of the Cypress Police Department and certainly deserves recognition as the 2017 Officer of the Year.